This past spring I had the privilege of picking up this frame from Vicious Cycles. They are a small frame builder in La Platz, New York. Known for very custom and unique paint jobs, this one of their recent creations. 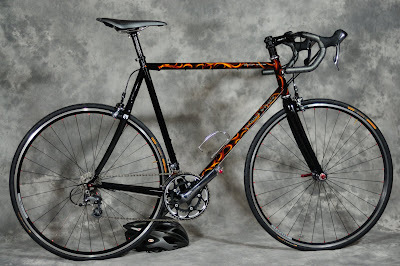 The frame is made of Reynolds 853 custom drawn tubing with Reynolds carbon fiber seat stays. I had my option of forks, from one of their custom steel forks to any carbon fork made. I opted for a custom painted ( black to match the base color) Reynolds Ouzo Pro. Then came the really tough decisions what part to hang on it. Went with a full Shimano Ultegra SL group, Chris King head seat and hubs, Velocity rims, Thompson stem and seat post, and Salsa short and shallow carbon handle bar ( love the flat top, very comfy). I even went for a full set of sealed Gore cables (these things work great). Finally got a chance to get good photo of it, and blog about to tell everyone just how great it is. If you want to talk about it, come on in to Penisula Century Cycles and I might let you ride it. Nah, just kiddn -- but would love to show you if you're interested.